For the first time, an exhibition attempts to interpret Domenicos Theotokopoulos based on the social and cultural environment that has set his sovereign artistic choices. The report is developed in three sections. The first presents the importance of Crete for Venice in the 16th century and maps the social, ideological and economic structure of the island, with a tool for the city-country relationship. 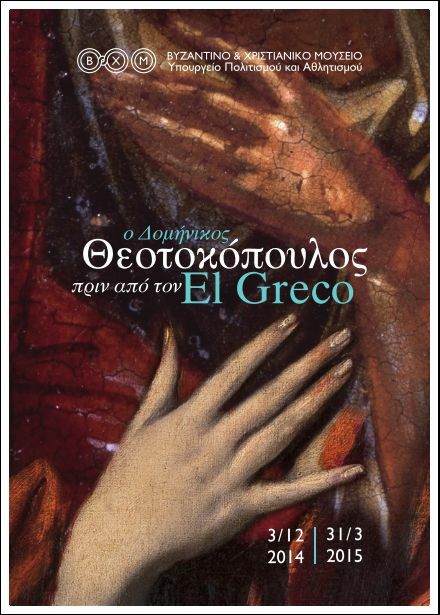 The second examines the artistic phenomena of the particular urban, cosmopolitan environment of the Cretan cities, emphasizing how Cretan painters attempted to combine Byzantine with Western tradition. The last section builds an interpretation for the Cretan period of Theotokopoulos, with a basic tool for the stylistic examination of his works and their comparison with other Cretan works. What were the reasons that led Theotokopoulos to depart for Venice in the fall of 1567 or the spring of 1568. Disposing of exhibits for the periodical exhibition “Domenicos Theotokopoulos before El Greco” at the Byzantine and Christian Museum, as part of a larger tribute to the 400 years since the death of El Greco. Byzantine and Christian Museum’s periodic exhibition titled “Art and Society in Crete during the Domenikos Theotokopoulos” – which will last until March 2015, aims to present to the public the environment in which the artistic physiognomy of Domenikos Theotokopoulos in Crete, before his departure for Venice. The exhibition, following the modern museological principles, develops vertebrate, with basic axes of various aspects of society and art in the second half of the 16th century. The exhibition, following the modern museological principles, develops vertebrate, with basic axes of various aspects of society and art in the second half of the 16th century.